Amy Prisco is a licensed Realtor at the Island Estates International office located on the Malecón in Salinas, Ecuador. Amy is a bi-lingual real estate professional servicing both local and international clientele with their real estate needs, such as: sales listing agent, buyers agent, rental agent, and/or property management. Amy has been living in Ecuador for over 11 years of which 10 have been in Salinas. She has an MBA in Finance, an MA and BA in Spanish, and has been working in real estate in Ecuador since 2008. She was the first foreigner to obtain the Ecuadorian Real Estate License back in 2010, which currently remains active (#166-G). She covers the southern coastal areas from Anconcito all the way north up the Ruta del Spondylus to Puerto Cayo, specializing in Salinas. Ecuadorian cell phone/whatsApp/texts: 096-704-3050 USA phone: 646-396-1026 Facebook: Ecuador Realty Amy Prisco Salinas Ecuador Instagram: Amy Prisco Ecuador Real Estate Website: AmyPrisco.com Email: info@amyprisco.com We look forward to hearing from you!! Live at the beach and not have a balcony??? No worry with this condo – the balcony is huge and will be where you spend the majority of your time. 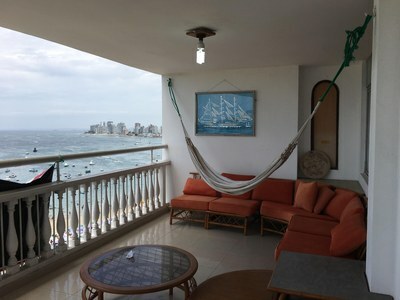 Great views of Salinas beach and the yacht club can be seen from this high floor unit. Sunsets and sunrises are a bonus, as are the nice ocean breezes. The condo itself is about 1500 square feet and has 3 bedrooms, 2 full baths, a living room, a kitchen and a laundry area with half bath. The unit has an assigned parking spot and storage room (bodega). Monthly HOA fees run approx. $150 and the yearly taxes are around $400. The building has 24/7 security. Being sold un-furnished. Live in the sunshine, swim in the sea ~ this is the only place to be! Enjoy fabulous ocean-front living in this impeccably maintained and manicured property. So many details and design features that will make you never want to leave!!! 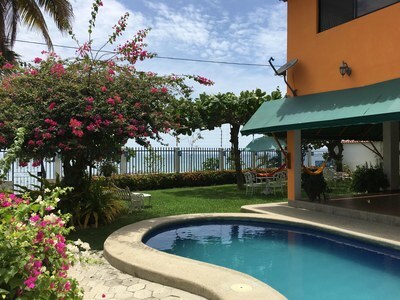 This property sits ocean-front on a corner lot and the house is over 2000 square feet; all designed with love. The fabulous lawn and mature landscaping offer shade and seating areas along with a nice water feature at the entrance to the property. There is a huge wrap-around covered porch with multiple seating areas. The pool is off to the other side of the house where there is also a bbq area. The house itself is two-story and the downstairs hosts the social areas: large living room with high ceilings, a separate dining room with huge table for entertaining many, a small nook for game playing, a visitor’s half-bath, a nice size kitchen with plenty of room to cook and prep, and a laundry area off the side. Upstairs there is a sitting area at the top of the landing, followed by two large bedrooms which share a big bathroom, and then there is the enormous, beautiful master bedroom suite overlooking the ocean with huge walk-in closet and large bathroom with double sinks and tub. There is a care-taker who lives permanently on-site and is in charge of all gardening, pool maintenance and exterior cleaning. The La Milina area of Salinas is quiet and the beach is calm, great for walking and wading. Year-long contracts are $1500/month plus all utilities. Watch the most fabulous sunsets from your dream home on the beach. This property is truly spectacular and magical. Impeccably manicured lawn and landscaping are a big part of what makes this property so attractive. Privacy and space and yet a cozy home feeling. 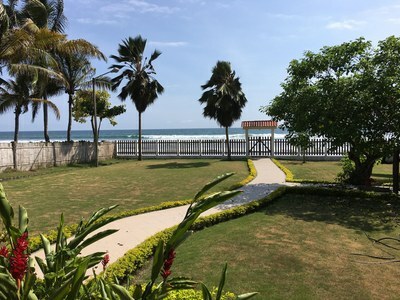 The house is approximately 1800 square feet on two levels with the master bedroom and bath being upstairs with a small Juliet balcony overlooking the yard to the ocean. Downstairs there is a huge living room, a large separate dining room and a nice sized open kitchen with big pantry and laundry room. Outside there are two extra bedrooms with shared jack-jill full bathroom. The best part of the property is the outdoor seating area which has both a dining area as well as separate seating area; both covered. There is a nice bbq grill area off to the side. The on-site caretakers look after the entire property and perform all the maintenance. This property is available for long-term rent only at $2,000/month plus all utilities. Island Estates International, Ground Floor of the Alamar Building on the Malecón of Salinas, Ecuador. Island Estates International, Local PB del Edificio Alamar en el Malecón de Salinas, Ecuador.